Helping move families & businesses in the Jacksonville area since 1998! We use the latest packing & transport techniques to move your belongings safely & efficiently. We can transport and store your valuables until you need them. We offer affordable packing services to help you prepare for your move. 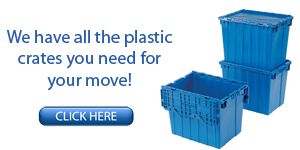 We offer a wide range of plastic crate rentals for both residential & commercial use. Located on Atlantic Blvd just over the Intracoastal Bridge! Looking for local or long distance movers in Jacksonville to help you move? Day or Night Movers specializes in commercial and residential moving, and we're equipped to manage moves of all sizes. Our team is available around the clock at no extra charge, so whether you want to move at 8 a.m. or 8 p.m., you can count on us to move everything whenever you want for the same affordable price. We've been in business since 1998. and we've established an exceptional reputation throughout Duval, St. Johns, Nassau and Clay Counties as one of the most reliable moving companies in Jacksonville, FL. That's why over 85% of our jobs are client referrals or repeat customers. Call us at (904) 247-6683 for more information! Our moving specialists have been extensively trained by our lead foreman. We do not hire day laborers, so you can rest assured that our team is experienced using the latest packing and transport techniques to move your belongings safely and efficiently. Our employees arrive promptly for every appointment wearing a uniform shirt bearing the Day or Night Movers logo for easy recognition. Want to learn more about our Jacksonville moving services? Call Day or Night Movers now to consult with an expert mover or schedule service. We're proud to help customers throughout Jacksonville, Baymeadows, Orange Park, St. Augustine, Jacksonville Beach, Atlantic Beach, Ponte Vedra, Palm Valley, Julington Creek and Yulee.